Which goddess (Ishta devi/Kula devi) sits legs folded & holding shiva linga? 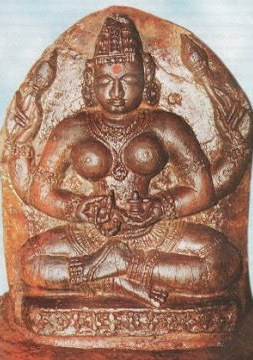 Goddess sitting and holding shivling on one hand. And sitting folding both legs.Please help me find this goddess and details about the temple I'll find her if possible. It is Istha Kameswari Devi having four hands, in two hands having lotus flower and in other two hands one have shiva linga and other one have japa Mala. It is a form of devi Parvati. The very special thing is when you apply kumkum on the forehead of the Idol of the goddess you will feel like touching human skin in fact the Idol is of stone. It is located in kurnool District, approximately 15km from srisailam, Andhra Pradesh. Not the answer you're looking for? Browse other questions tagged temple identification-request goddess idols . What is the significance of Chakra of Konark Sun Temple? What is the ritual procedure for linga sthapana in a temple? Does anyone know the name of this goddess? Which scripture mentions Vasishth praying to Tantrik Goddess Tara? What is the basis of this image of Goddess Kali?